A bit of good news! On Thursday, the Ohio Supreme Court filed its decision in the Black Fork Wind case. In a 5-2 decision, the OSC ruled in favor of the local citizens who have been fighting this battle since 2009. A copy of the decision is attached. This project has a long and tangled history including an application filed in June, 2014 to amend the project with bigger turbines. This amendment was filed only days before the “new” revised setbacks measuring from property lines became law. We think the timing of that filing was purposeful and was intended to dodge the new setback requirements. Since that time, the developer has requested other amendments to their certificate, including additional extensions of time. But after the 2014 setback law became effective, requiring amended projects to lose their grandfathered status and adhere to the revised property line setbacks, the developer and the Ohio Power Siting Board chose instead to consider these changes by way of “motions” not “amendments”. The Ohio Supreme Court case challenged the OPSB’s use of motions when amendments are required by law. The decision in favor of the local citizens was written by Justice DeGenaro and joined by Justices O’Connor, Kennedy, French and DeWine. Justice Fisher wrote a dissenting opinion in favor of the Power Siting Board and he was joined by Justice O’Donnell, father of wind lobbyist and attorney, Terrence O’Donnell. Justice Kennedy separately wrote an opinion on why the Fischer/O’Donnell dissent was wrong and Justice DeWine agreed with Kennedy. Sadly, Justice DeGenaro was defeated in the recent election. Justice O’Donnell has been forced to retire due to age limits. Both DeGenaro and O’Donnell will be replaced in the New Year by Cleveland Democrats, Melody Stewart and Michael Donnelly. The Black Fork case will now be sent back to the Ohio Power Siting Board. We think the project should be considered “dead” because the certificate has expired. Black Fork, which is owned by Capital Power of Alberta, Canada should be required to start from scratch. The Court’s decision acknowledges that the OPSB could declare the Black Fork certificate to be expired. It remains to be seen what OPSB will do. The wind developer wanted to submit an additional document which challenged the constitutionality of the setback provisions but the Court denied their request. The issue of whether the setbacks are constitutional was raised in a lawsuit filed last November in Paulding County by four leaseholders and MAREC (Mid-Atlantic Renewable Energy Coalition) whose attorney is Terrence O’Donnell. See www.toledoblade.com/business/energy/2018/11/15/property-owners-sue-over-wind-turbine-setback-requirements/stories/20181115180 for more information…. Amended plans for a proposed wind farm must return to the Ohio Power Siting Board and go through the board’s amendment process. (Image: Thinkstock/mj0007). 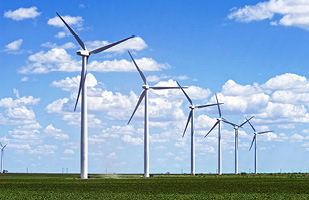 Altering a wind farm’s construction timeline is an “amendment,” and a proposal for a 91-turbine farm must return to state regulators for an extension, potentially subjecting the facility to stricter state rules, the Ohio Supreme Court ruled today. more BigWind=MORE FOSSIL fuels. How?